When boiling water for your tea, an electric tea kettle may be your best choice, and the safest! Heating water is the first part of the tea preparation, so we want you to enjoy every second of it. However, before explaining the necessary steps to boil water in an electric kettle or even in a regular one, let us share with you some trivia about the history and development of the tea kettle. This may be the right choice for you and your tea. A kettle is a kitchen appliance used for boiling water. When you need to heat water to prepare a hot drink, this is the best choice. You can find electric kettles or kettles for stovetop use and they can be made of plastic or steel. The choice is yours. Cast Iron Kettles were people’s choice to heat water for hot drinks between the 1880s and the 1920s. With good thermal qualities, a cast iron kettle boiled water on top of a stove. This is how the first hot water kettle was born as we know it. Later, between the 1920s and the 1930s kerosene kettles were the most common choice. When using these kettles, people no longer had to heat up the whole stove to enjoy a cup of tea. However, the use of these kettles would release more smoke around the house. Somewhere around 1938 chrome-plated steel kettles become extremely popular in Australia, because they ran on electricity, which was a rare thing at the time. 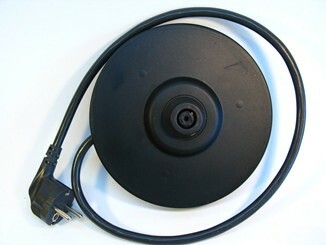 Improvements were made to make kettles safer - the coil was inside the kettle and not exposed; it had an overload cut out switch and the cord was cotton insulated. In 1949 boiling water become easier and more efficient with the ceramic kettles, which ran on electricity as well. Like the previous ones, they also contained a cotton insulated cord for safety reasons. Between the 1950s and the 1970s ceramic kettles, also known as ceramic jugs, underwent some improvements like the introduction of whistles and cut out properties. In the 1980s new kettles came out. With cheaper material, polymer body kettles were very popular and widely produced. Producers continued to present many safety characteristics such as whistles, cut-off switches, windows in the side to control the amount of water in the kettle and plastic cord insulation. Though this was more durable, it conducted heat badly. 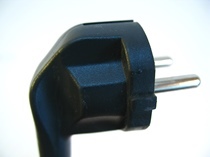 By having a base, which allowed the jug to rotate and be detached, reducing the risk of electrocution. After 2000 the electric tea kettle continued to work towards safety. Whether made of metal or plastic, but with new polymer handles that didn’t conduct heat, these electric tea kettles, had new safety features to protect you while boiling water. A cut-off switch to stop the water heating after it boiled; an easier base to quickly place and remove the jug. All these improvements mae the electric tea kettle a better choice for you. Indeed, a much safer choice. Fill your tea kettle with the necessary amount of water. 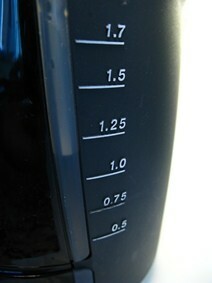 If your electric kettle has a temperature setting, take advantage of this. If you need water below the boiling point, you can save both time and energy. Enjoy while the water boils, though be sure to keep an eye on it. You don’t want the water to evaporate, if boiling more than necessary. 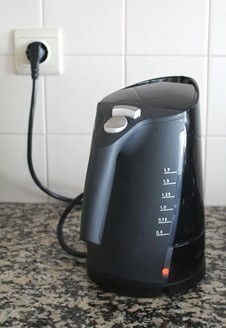 Using an electric tea kettle should prevent this as it will turn off once the water boils. Take a tea pot, fill it with water and then choose your favourite teabag to plunge into it. Put a lid on it and wait for it to release its amazing flavour and colour. If you are using loose tea leaves, be sure to take one of your tea strainers, before pouring the tea into your cup. Now get ready to drink. Add sugar, milk or any other thing that might please you and enjoy your beverage. Using a regular stovetop tea kettle may allow you to use a cooking thermometer so that you may heat water for your tea to proper temperature. Not all teas require water temperature to reach 100ºC (212ºF). However, using a stovetop kettle requires that you pay attention to it. Water may evaporate, or worse it may boil over and put the fire out while the gas it still on. If this should happen, turn the gas off, put out all flames and open some windows. If you smell gas, don’t use electrical switches. So remember, please don’t leave your kettle unattended. Are you in a hurry and there isn’t a kettle around? If you don’t have an electric tea kettle, you may use your microwave oven, though we don’t recommend it. You may choose to do this if you are in a hurry and don’t have time to stand next to the stove keeping an eye on your boiling water. Please, make sure you look at the some tips at microwave safety when heating your water, as you may cause yourself some needless injury. The best and the safest way to boil water is to use an electric tea kettle. Whether you prefer a stainless tea kettle, a cordless kettle or a glass tea kettle, among others, it’s up to you. We just want to give you a safer choice for you, your family and your tea. Be aware that tea kettles are only used to boil water, unless you are planning to drink and herbal tea that requires for the herb to be boiled. Make sure you don’t boil other things in the same pot, because the water may pick up a different taste and it will obviously affect your beverage. a NEW electric tea kettle?